Home owners on the west side of Reunion Resort will be pleased to see that the clubhouse is finally taking shape. The Nicklaus course opened for play in 2007, but after 10 years without a clubhouse, we finally get somewhere for golfers to park, get a cart and begin their rounds comfortably. We await details of the amenities offered by the clubhouse beyond golf admin. 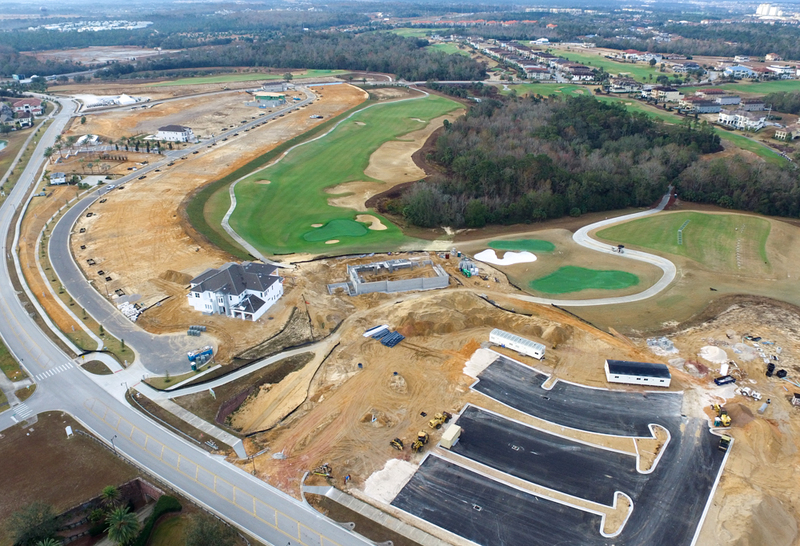 Also within the image, we can see the first custom home of the Bear’s Den community, overlooking the 18th Green of the Jack Nicklaus PGA course. Designed by ZERO LATITUDE, this is the first custom home along the west side of the street, offering great views of the green and fairway. To the upper left corner, three production homes and the Bear’s Den sales center can be seen. Over to the upper right corner of the image, we can see Castle Pines Ct and Desert Mountain Ct, with Championsgate’s Omni in the very top right corner. Next Details Are Driving the Demand in Reunion Resort!